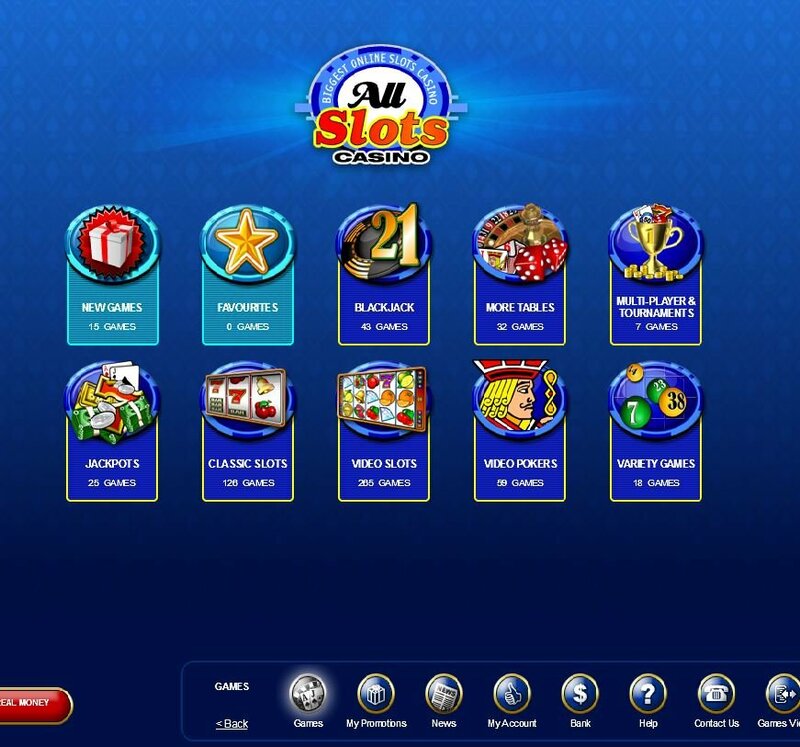 All Slots Casino has been in business since 2000 and is a flagship brand of The Jackpot Factory. Powered by Microgaming and accredited by eCogra (Seal of Approval) and GamCare. Looks like this online casino ticks all the right spots but, how does it perform under gameplay pressure? All Slots Casino seems to be having a love affair with the much maligned Internet Explorer browser. In fact, I actually thought I had uninstalled this IE browser in its entirety from my computer until I started the All Slots Casino software download. All external links and online chat with the casino defaulted to Internet Explorer. I therefore set out on this review with trepidation. Seeing that All Slots Casino runs on Microgaming assuaged my fears slightly as, this is one of the most popular platforms in use, as you can see from Julian's review of it earlier this year. When entering the lobby, your game choices are neatly arranged for you. From new games, favourites and blackjack to All Slots Casino Jackpots and classic or video slots, all your bases are covered. The range of Blackjack and tournament games is astonishing and, this casino really is a one-stop shop for all your online gambling needs. I especially like the hushed chatter at the beginning of the table games, along with the clinking of glasses and elevator music, to give the air of having arrived at a real casino. On that note, where is my drink? The user interface is simple to use and, using the favourites tab, you can bookmark your winning games for future reference. Games took a while to download but, my internet at work does slow down during my lunch hour and plus, after dealing with some real top notch casino software, I don't like waiting more than 5 seconds to dive in and start playing. One of my favourite All Slot Casino games is the new Break the Bank. Firstly the image of breaking into a bank and playing with all the delights it has to offer is like catnip to this online gambler and, the graphics most definitely do it justice. The bomb graphic representing the scatter symbol is nothing short of genius. Jack & Jill rhyming reels was slightly too graphically girly for me, despite enjoying the simple reels. Also, I feel that calling this a rhyming reel, they could have at least made more of the music angle - as you VegasMaster loyal readers know, I have quite a thing for good music in online casino slots. The user interface is simple to use and, using the favourites tab, you can bookmark your winning games for future reference. All major financial institutions demand 128-bit SSL (Secure Socket Layer) Digital Encryption and All Slots Casino meets the level of security demanded. All Slots Casino payment methods are varied and, withdrawal is possible to many of your favourite methods. There is also a nifty All Slots Casino bonus where you start earning loyalty points just as soon as you start playing. All games are included (although some games offer more points than others) and you can redeem these loyalty points for casino credits. In order to fully welcome you to the casino club, All Slots Casino bonus welcome package includes 100% cash back on your first deposit. You can also look forwards to a 25% cash back on your second deposit, a 50% cash back on your third deposit and another 25% cash back on your fourth deposit. All Slots Casino bonus programmes promote loyalty with available bonuses always changing and being added to. There is a handy tool that keeps score of the games you have played and shows you the available jackpot winning for that game. Maybe next time you won't miss out on it!